Yes, it's been a year! Last April I started blogging once a day and then, in the middle of May 2012, I started writing two blog posts a day, even on weekends! That was intense ... okay, crazy ... and I went down to one post on Saturdays and Sundays. I've cut back the past couple of weeks, now I'm blogging five times a week, but I thought I'd write about what blogging every day for a year has taught me. It sounds silly when I put it like this, but blogging every day has taught me that I can write every day. Blogging every day helped me get over my fear of the empty page by helping me develop work-arounds. For instance, I now know I have a much more difficult time writing a first draft on my computer than I do in a journal. If I write my draft long-hand I rarely get writer's block. If I write my draft using a keyboard ... well, that's a non-starter. I'm not sure why this is, but having discovered it out I go directly to my journal. It takes longer to write all my articles, all my stories, out longhand and then transcribe them into my computer, but the work gets done and that's the important thing. I think I have a pretty good handle on what folks find moderately interesting, but I regularly fail miserably at guessing what people will think is tremendously interesting. Articles that I thought would be of interest only to myself and a couple of other cave dwellers have been my most popular, and articles I thought would be insanely popular turned out to be no more popular than average. What is more interesting, though, is that every single time I felt I was writing uninteresting drek the article was at least as popular as average. The lesson is that even if everything is screaming at me saying I'm writing drek I need to keep writing. Nine times out of ten the feeling passes and, even if it doesn't, even on my worst day, my writing turns out not to be as terrible as I had thought. It is difficult for me to write about something that doesn't, on some level, interest me. This is one reason editing is such a chore. At some point in the editing process I begin not only to loath the story, but the very sight of the manuscript gives me hives! Okay, maybe not hives, but I do begin to find reasons, any reason, not to work on it. My fix? Put the manuscript aside for a time and go on to something else. How long? It depends. At some point I'll be sitting down, my mind will be wandering, I'll be thinking about future projects and I'll remember a story I put away. Its incompleteness will bother me, like an itch that needs to be scratched. Then I'll reach into my "down time" drawer, pull out the manuscript, and begin working on it again. Coming back to the story with new eyes is like starting over. And chances are it'll be much easier for me to spot, and fix, its weaknesses. I realize this--putting your manuscript away in a drawer and forgetting about it for a week or a month--isn't always possible for folks who have external deadlines, but I do think that taking some time away from the work can often help improve it. That's it. That's the only downside, but it's a big one. Periodically bloggers write about whether folks should blog, or how much folks should blog, but I think it's probably different for every person. Each of us must struggle to find that comfortable medium where we reap a benefit without taking too much time away from the work that puts food on the table. Why do you blog? What has blogging taught you? 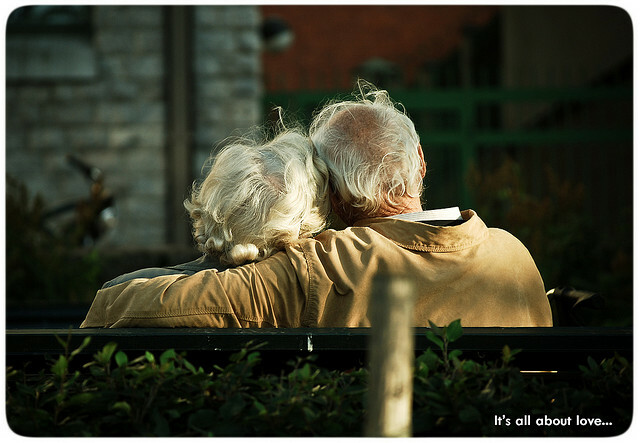 Photo credit: "It's all about love" by kevin dooley under Creative Commons Attribution 2.0. Holy cow! A whole year! And I thought I was crazy for starting a marathon of writing tips--26.2 tips in 26.2 days. I'm on day seven as of today. It is a commitment! The question is: what will be your schedule from now on? As for my current schedule--and thanks for asking!--I'm blogging 5 days a week, Monday through Friday, but I'm taking the weekends off to concentrate on my fiction writing. Blogged every day? For a year? That's a fine effort! I aim for one post a week and I'd struggle to put out more than that. The trouble is my blog is photo heavy, so processing pictures is time consuming. I can't imagine an outdoor blog post not having images! I can sympathise with all the things you've mentioned in this post. Many a time I've laboured over an entry that I think is great, but it's barely read, yet some crap I put together in about 10 mins is popular! To me, blogging seems like an exercise in talking to myself! It's hard to know the audience when one has a blog that's predominantly outdoors, but will throw in subjects that are off-beat, such as movies and music. So, as I'm not sure who's reading what, I've just stuck to writing about what I like and leaving it at that! It does give me entertainment and I guess it's made me write a lot better (not sure about this comment though), not to mention editing! I look at my early posts from a few years ago and they're shockers! Regular writing has certainly helped in that regard. "The trouble is my blog is photo heavy, so processing pictures is time consuming"
Yes! I know what you mean. I get most of my pics from Flickr and, still, it adds about 10 minutes more per post. I can't even guesstimate how long it would take me if I was using my own images. "To me, blogging seems like an exercise in talking to myself!" Yes, that is exactly how I felt before wonderful folks such as yourself started leaving comments. And you're right, it helps to write regularly. Even if it isn't fiction and even if one is having an 'off' day. Writing every single day has helped me enormously. Great post, and happy anniversary! Staying consistent is definitely hard. Congrats on surviving a year. Twice a week is more than enough for me, I don't think I'd get anything else done if I did anymore. Wow. I had every intention of blogging every day for a year this year and I totally lost my groove after three months because I lost (or never found to begin with) my purpose in doing it. I just wanted to say I really enjoy your blog and have spent a while going through and reading a lot of your archives - you have some great links and articles for writers. Keep it up, and thanks! Some great lessons! I agree with all of them except for the writing longhand (I just can't do that, can't keep up with my brain!) I'm impressed that you've written a post a day for a year, that's quite an accomplishment! I blogged every day in April last year in the A to Z Challenge, then blogged more haphazardly for six more months. At that point I arrived at the why-am-I-doing-this plateau, but I couldn't come up with a good answer other than I like to write. I restarted blogging with this year's A to Z Challenge in April, then moved right into the Blog Every Day in May Challenge. I found that I like blogging every day, but writing to an unknown audience is a challenge in itself. Like you, some posts that I thought would do well floundered. And vice versa. Oh, well. Congratulation on blogging every day for a year. Maybe I'll do that...next year. "I couldn't come up with a good answer other than I like to write"
Best reason in the world! "writing to an unknown audience is a challenge in itself"
This may sounds strange, but I also found it liberating. It gave me the opportunity to be myself, to let it all hang out. It was kind of like running around in costume, I could be anything, do anything, no one would care, no one would even notice. One day you'll realize ppl are reading (they probably were all along) and then (if you're like me) there will be moments of panic, but by then you'll be used to being who you are and it won't matter. I guess that what I'm really trying to say is that blogging can help someone find their voice, even if (it seems that) no one is reading.